Hello, My name is Beth, and I am addicted to t-shirts. I love buying them, wearing them, and making them. They make me happy. 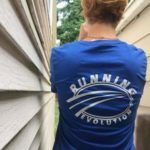 When I started Running Evolution, I really wanted to get shirts on all our runners that weren’t that stiff a technical material. 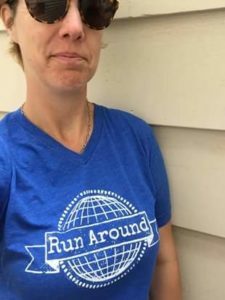 A running t-shirt that runners could wear, when they weren’t running, and that were super soft with fun designs. I took the next step and made a separate brand called REC:Shirts, and had that business for a few years, and then realized that it became impossible to have 2 businesses, raise a kid, and be functioning human being. Lesson learned. So, now I am making small batches of shirts, that are in the same vein, really soft, feels amazing on your skin and fits just right. Here is the newest one, The Run Around. We only have 19 of these bad boys, so get em while the getting is good. V-neck, super soft and has a RE:Stamp on the back. Sizes run true to roomy. (pictured medium) $24.90 plus shipping. This entry was posted in Uncategorized on June 26, 2017 by Beth Baker.